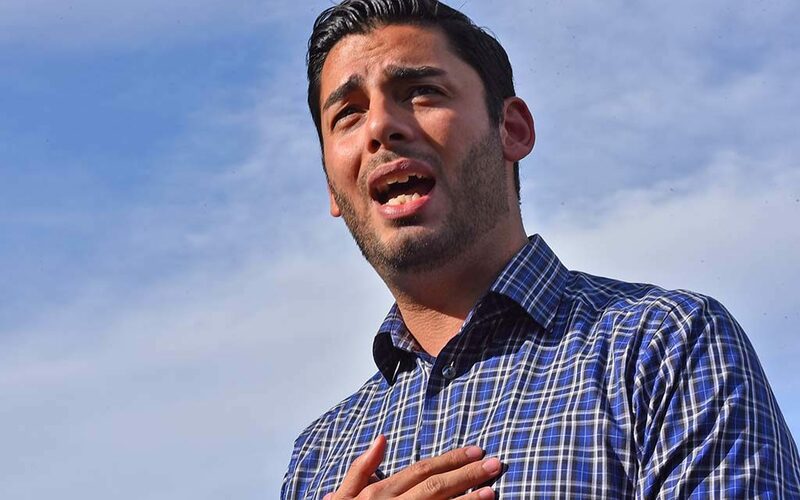 Democrat Ammar Campa-Najjar says his losing congressional race against indicted Rep. Duncan Hunter was full of surprises, so he’s hoping for yet another — a victory. He thinks uncounted ballots in San Diego and Riverside counties could flip the 50th District in his favor — despite trailing by 8.6 percentage points. “Election officials in San Diego and Riverside counties are reporting that there are over 490,000 and 250,000 ballots in their possession that have yet to be reported, respectively,” a spokesman for Campa-Najjar noted Thursday. Hunter won by 13,135 votes, according to final unofficial precinct counts from the two counties. In San Diego County, Campa-Najjar lost by 7.8 points, or 10,888 votes. But it wasn’t immediately clear how many of the 740,000 uncounted ballots — including mail-in and provisional — were in the 50th Congressional District. Thursday afternoon, county Registrar of Voters Michael Vu told Times of San Diego that his office couldn’t provide a count of 50th District ballots still to be processed. Among the office’s chores are verifying ballot signatures, taking ballots out of envelopes and having them scanned for Thursday night’s count. In a statement, Campa-Najjar said he had no regrets. He said it’s important to count every vote. Harrison said that Hunter’s campaign confirmed with the California Secretary of State’s Office that all precincts had reported before issuing a statement Wednesday. “If [the] San Diego County Registrar of Voters indicates that they are still counting votes, then Congressman Hunter supports efforts to ensure that every vote is counted,” he said. Nick Singer, the Campa-Najjar spokesman, quoted a San Diego Union-Tribune report that said it’s possible as many as 15,000 Escondido ballots remain uncounted. 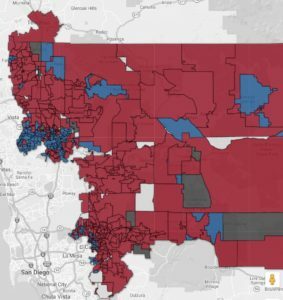 Inewsource map showing blue precincts that favored Campa-Najjar and red favoring Hunter. Singer said City Council candidate Maria Nunez owns a slight lead against her Republican rival with thousands of absentee and provisional ballots yet to be reported. According to the latest registration report, Escondido has about 68,000 voters — nearly evenly split between the parties (as well as 20,000 who don’t declare an affiliation). San Marcos has about 45,500 — with 14,621 Democrats, 14,653 Republicans and 13,709 independents. If the voter turnout there matched the 65 percent of the county, as officials suggest, and 70 percent vote by mail, close to 52,000 mail-in ballots were used in those two cities. But it isn’t known how many are still to be tallied. San Diego County Democratic Party Chairwoman Jessica Hayes was hopeful as well. Hayes said she assumed that San Diego County’s nearly half-million late-counted ballots are spread throughout the region.